MM's Kitchen Bites: Sindhi Kadhi/Vegetable curry with toasted Chickpea flour gravy...BK's special treat!! Sindhi Kadhi/Vegetable curry with toasted Chickpea flour gravy...BK's special treat!! Sindhi Kadhi (Vegetable curry with toasted Chickpea flour gravy)...my version…'version' as people who know this one will tell you that it is not 'authentic' unless one uses cluster beans and lady fingers/okra…well we don’t like those two in curries and substitute with other veggies...the potatoes, drumsticks and kokum stay as per the authentic version…this used to be our regular Friday lunch at KJ’s house during college time with Sindhi Aloo Tuk ( double fried potato chips)…completely forgotten over the years till BK got married and then started bringing this to office as a special treat…I had never attempted to make this till very recently…I could have asked BK to get the recipe from her mom in law but she was traveling when I first made this and so in came google aunty to the rescue…I have adapted this from Niru Gupta’s recipe, the only recipe that I could find that had Kokum in it…authentic or not, hope you try and enjoy!! Lightly sauté all vegetables in a pan one by one using minimal oil and keep aside. Wash the dried kokum and soak in half a cup of water. Heat oil, in a heavy-based pan. Add cumin seeds, mustard seeds, fenugreek seeds, asafoetida and curry leaves to the pan. Once the seeds start spluttering, add ginger and sauté on low flame for a minute or two. Add besan and sauté till it becomes fragrant and changes colour to light brown. Add grated tomatoes, salt, turmeric, green chilies and red chili powder and mix well. Fry for 5-6 minutes. Slowly add water, half cup at a time and mix well with a whisk so that no lumps are formed. Increase the flame to high and bring to a boil. 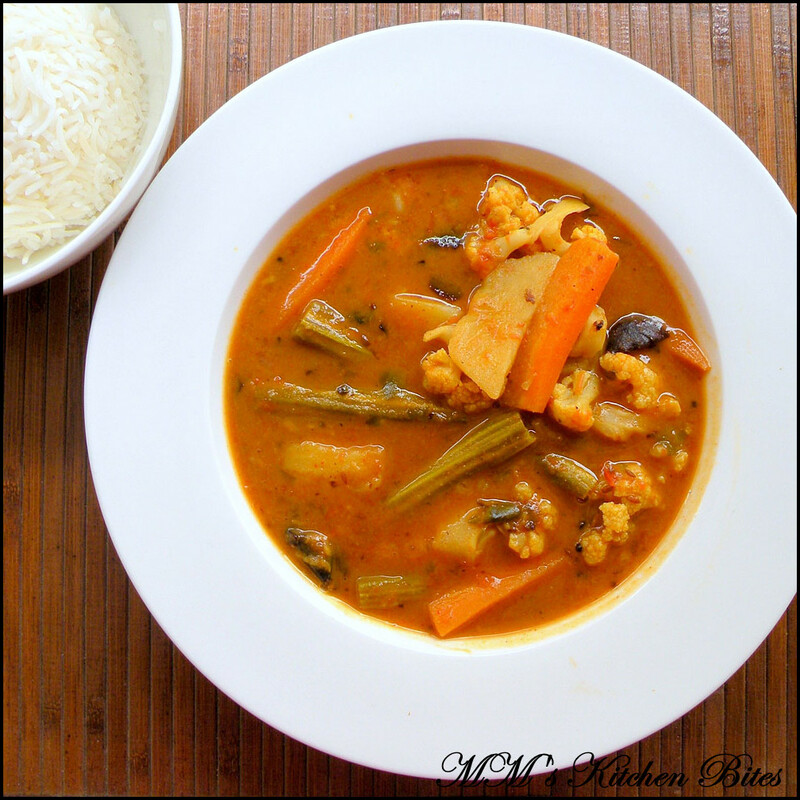 Once it comes to a boil, lower the flame, add in the vegetables and kokum and simmer till the vegetables are cooked through – about 10 -15 minutes. If you don’t have Kokum use Tamarind instead. Soak some tamarind is water for half an hour. Mash it up, use the paste and discard the pulp. You would need about 1-2 tbsp. nice click! A delicious curry! Wow, never tried this. For a moment I thought it was kinda of a sambhar and checked the recipe...Interesting dish. I love this too,never knew that kokum was used in the authentic version...will sure try it out :) looks yummy ! so u think Google is an Aunty not an Uncle ?? Just kidding !